Decisions, decisions. 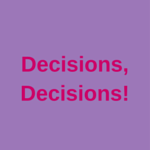 “I have made a decision” – when a client says that, I really appreciate the energy behind it. It’s not just the decision made and the feeling of having done that, it’s the knowing that we are decisive and can stop that energy drain of humming and ha-ing. Doesn’t mean thinking through everything isn’t important. But so is the decision to know when you’ve done enough of that. Making a decision feels good. Work done once is easier next time. The first time for a lot of things is the hardest. It’s not all downhill from there but everything gets easier with practice. When under stress, look out for what is ESSENTIAL for this week. Do that. And only that. Sometimes what you don’t do is as vital as what you do. Leave room for you in your life. The Art of Guest Posting. Pitch or wait to be asked? Both have their place. Do both. Visibility. There’s a lot of fear around being visible online and off. And yet we know we must embrace it as part of our marketing. Initially it is out of our comfort zone but when our worst fears do not manifest, we can get comfortable with being seen. We must. If your To Do list is too long, it simply doesn’t get done. Make it shorter. Make it a Power List of 2 which will really make all the difference. Otherwise it’s a rolling list which never gets done and starts to be rather depressing. Vibration is everything. Feel good. Light attracts light. Dark attracts dark. Whatever you want in your life and how you want to be feeling, feel it first. Choose your feelings. Learn how to manage your own state. Following up is key. If you aren’t good at follow up or you aren’t going to follow up for any reason, is the first thing worth bothering with at all? Time and money spent on mailshots, press releases, networking and exhibiting can all be wasted if you don’t follow up. I like to think of it as following through, like when you throw a cricket ball or use a tennis racket or golf club. Good things happen magically back at base when you are out and about having fun. Be clear about what you want. One thing. Go after it till done. Positive Mental Attitude (PMA) – expect things to go well and they do. The reverse is also true. Expect things to go badly and they do. Sometimes we are surprised when it’s vice versa, but it is as rare as rocking-horse ****. Trust more and let go of the need to feel in control of uncontrollable stuff. Your reward is ease and flow. Surrender. Especially if being the old you isn’t working. Allow the new you. Keep an open mind for opportunity. Think this one might have been on last week’s list too. Never mind, it’s a good one! Work fewer hours. Heed Universal warnings to do that or pay the price. No need to follow the herd. If you prefer to lead your own, create it. A prophet is never recognised in her own town. Me-time is essential. Stop skimping on it. Family: we have blood relatives and bloody relatives! How much better could your business be if it was all about the clients, not all about you? Measuring what works streamlines it next time you have to do it, creating acceleration and saving time and energy. The tears of emotional release are all good; let them fall. Create space for things to emerge. Step away from the machine. Have a life and be prepared to be amazed what a fabulous impact that has on your business too. Put on your magic shoes when the situation demands it. Or just every day like wot I do! Creating is easy, relatively-speaking. Marketing what you have created is a whole other ball game which can also be easy but requires a plan well made and executed and timed to be carried out for as long as it takes. Warning: It can take a while! Never under-estimate this bit. Whilst we love to create, the ka-ching is in the successful implementation of the marketing plan. But we can make that fun so you will love to do that too.